This episode mocks both the governments boggled attempt to manage the economy and the public’s common lack of understanding. 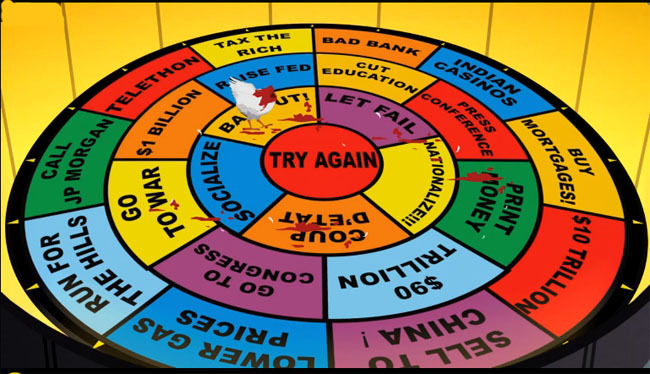 When the economy crashes South Park is put into one of its often occurring states of panic. False prognosticators come forward to offer varying opinions on the cause of the collapse: The government caused it, one man claims. It was the “covetous Jews,” Cartman proclaims (echoing the character’s often over the top anti-Semitism). But Randy claims the economy was angered by people spending too much money and buying things they didn’t need. He convinces the town to embrace a socialist style minimalist society, where everyone is forced to subsist on bare minimum, wear bed sheets as clothes, and play with squirrels instead of toys. Every opinion presented in the show represents a view of the economic collapse, even the conspiracy theorist ramblings of Cartman. While the town is undergoing their transformation, Stan is on a quest to return Randy’s Margaritaville Margarita Maker, a luxury now deemed wasteful. His journey takes him from a mall store to Wall Street to Capitol Hill, as he learns the ownership of his margarita maker has suffered the fate of home mortgages. The complex, yet accurate, process ends with the Feds sacrificing a chicken to determine the value of the margarita maker. Randy’s scheme to institute forced minimalist living is ultimately undermined when Kyle sacrifices himself by taking on the townspeople’s debts, enabling them to spend again. The local economy slowly rebounds as people once again embrace the idea that buying things and owning things is pretty cool.